You’ll need to have solid mathematical modelling skills, particularly solving systems of ODEs, and be proficient at writing scientific code, preferably R or MATLAB or acslX. From chats with a few people at the lab, management are especially keen to get someone who can bring in money so grant writing and blagging skills are important too. It’s a smashing place to work and the people are lovely. Also, you get flexitime and loads of holiday. If you are looking for a maths job in North West* England then I can heartily recommend applying. *Buxton is sometimes North West England (when we get BBC local news) and sometimes in the East Midlands (like when we vote in European elections). At useR!, Jonty Rougier talked about nomograms, a once popular visualisation that has fallen by the wayside with the rise of computers. I’d seen a few before, but hadn’t understood how they worked or why you’d want to use them. Anyway, since that talk I’ve been digging around in biology books from the 60s and 70s, and it seems they are full of them. So for those of you who haven’t seen the talk, here’s how they work. 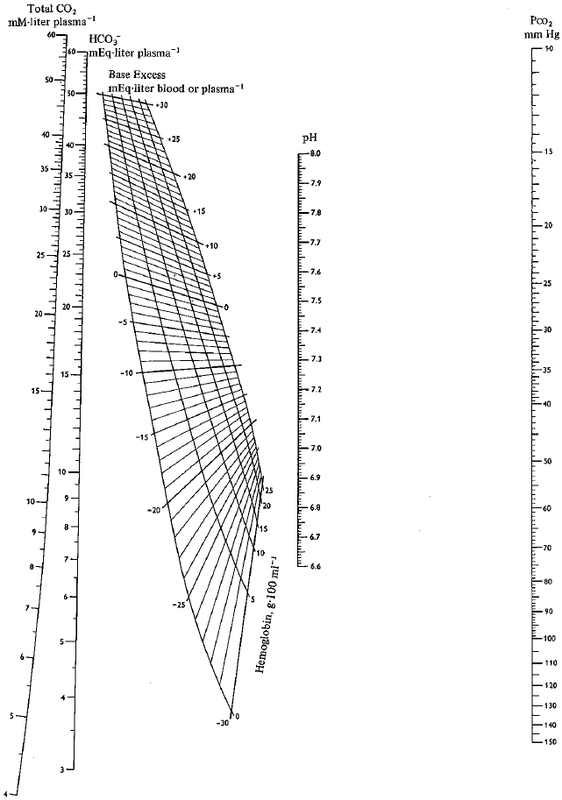 A basic nomogram consists of three scales. By reading off known values from two of the scales, you can estimate a third one. Here’s an example I found in the ICRP‘s reference manual. It’s difficult to measure people’s skin surface area, but height and bodyweight are very straightforward. 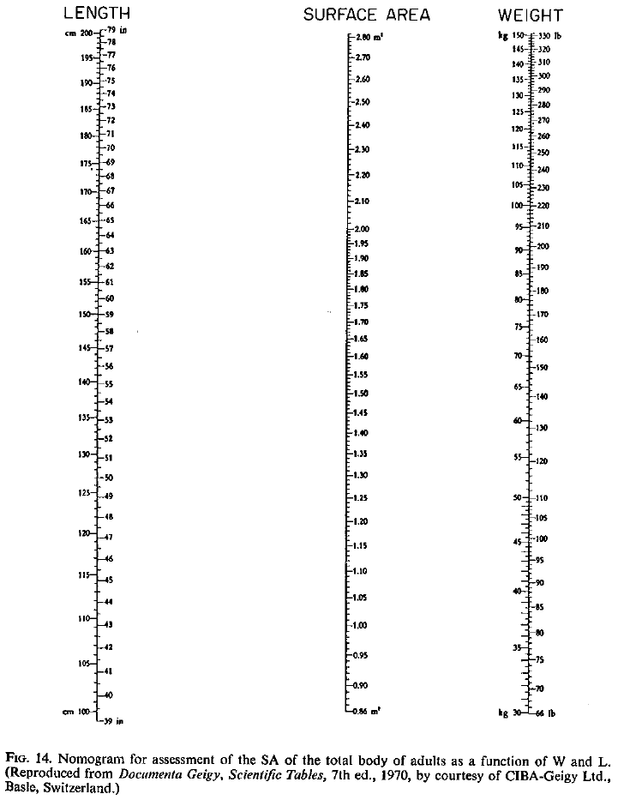 To use the nomogram, you place a ruler (or other straight edge) on the height* and weight scales and read of the point where the ruler crosses the surface area scale. I’m 177cm tall and weigh 72kg, so according to this, my estimated skin surface area is 1.89m2. 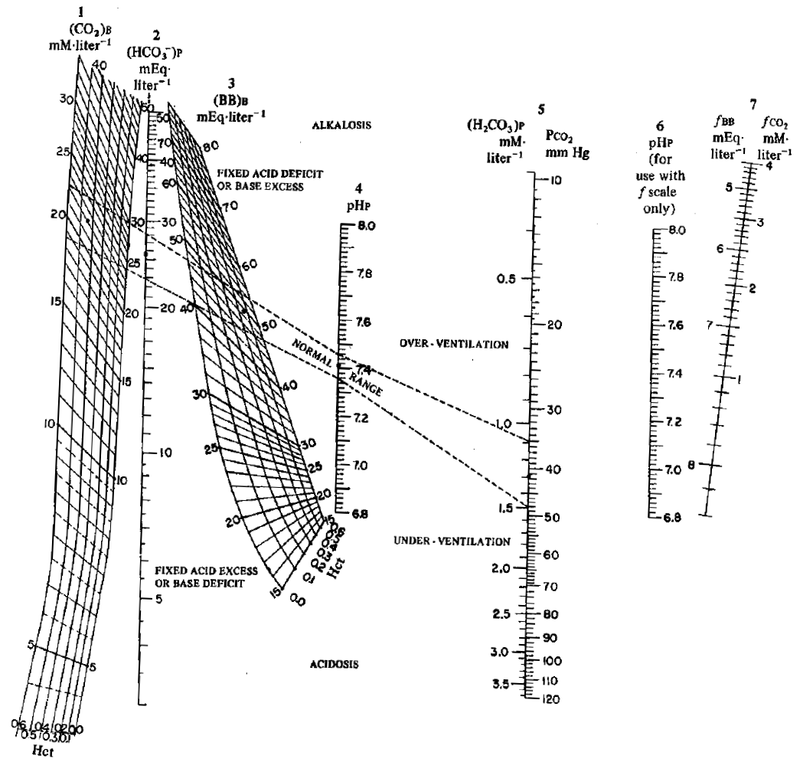 Altman and Dittmer’s Respiration and Circulation has many more pretty nomograms. I was particularly impressed by those on blood pH, reproduced below for your pleasure. Your homework is to dig out a pre-1980 textbook and hunt for more nomograms. *Gruesomely, the fact that the scale is labelled “length” rather than “height” makes me suspect that the bodies that provided the data were in a permanent lying down position – that is, they were corpses. I notice that the latest version of R has upped the maximum length of variable names from 256 characters to a whopping 10 000! (See ?name.) It makes the 63 character limit in MATLAB look rather pitiful by comparison. Come on MathWorks! Let’s have the ability to be stupidly verbose in our variable naming!